The patented design of SplitStop High Performance Screws features a unique shank slot for self-drilling, self-tapping performance, plus a fine thread pattern for improved holding and better control. Its knurled shoulder reams out the pilot hole, providing superior clamping power with less torque and reducing the risk of splitting. SplitStop screws automatically countersink to necessary depth, and the drive recess ensures better engagement with the drill bit and less slippage to prevent damage to the protective coating. The DeckEase Hidden Fastener has been designed to work with a greater number of decking brands and thicknesses of material than most other known hidden fastening systems. It's versatile “winged flange” design will fit edge-grooved kerfs of 1/8” to 3/16” thickness and 3/8” depth, whether manufactured in the factory or on the jobsite. They offer compatibility with both wood and composite, grooved decking materials. The spring-steel construction of the clip allows infinite deck-board spacing, so you can be assured of meeting the manufacturer's specifications, while providing a unique “breathing” quality that will allow a more natural expansion and contraction of the decking materials to take place. 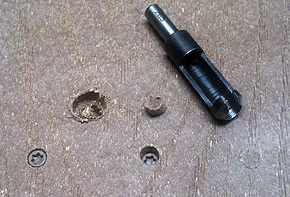 The clip's size, shape and side-mount design make installation a breeze with either an angle drill-driver or a small impact driver. Additionally, the DeckEase Hidden Fastener is finished with the same ACQ Rated finish used on SplitStop screws and carries the same Limited Lifetime Warranty Against Corrosion. DeckEase Hidden Fasteners are sold in a plastic pail package, which covers 200 square feet, twice the size of some other deck clip offerings, at a similar price point per package. This means you'll enjoy hidden fastening results at a very low cost too. 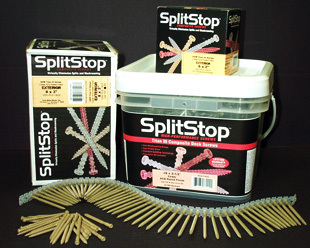 SplitStop Wood Screws firmly attach to the bit for one-handed driving. Available in 5 Finishes. Drive angle of SplitStop Wood Screws is increased without slipping or bruising of recess. Available in 5 Finishes. Provides excellent overall performance, in all types of composite decking, regardless of density or substrate materials, and does so without need of a “dimpling” step, in nearly all instances. Available in 3 sizes and 5 ACQ Rated colors, to coordinate with most decking boards. AVAILABLE NOW - 10x2 1/2" Stainless Steel for being used commercially or on-the-water. 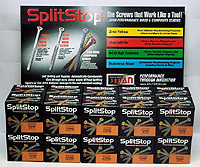 Look for the SplitStop screw display at your local lumberyard, home center or hardware retailer. Our high performance screws are made to the best American standards as defined by the Industrial Fastener Institute. We combined "state-of-the-art" technology with over fifty years of fastener engineering knowledge to design the most innovative and effective wood screw available today.